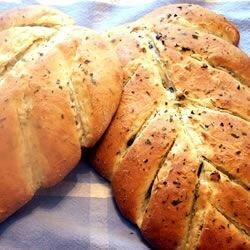 "This recipe for fougasse, the French version of the Italian focaccia bread, is topped with mixed herbs. The flat bread can be slashed to form shapes (a leaf, tree, or wheat stalk), or the slits can be cut to form a lattice, making the bread easy to pull apart." Pour water into a large bowl. Sprinkle yeast into water, and let it stand undisturbed until dissolved. Stir in 1 cup flour, 1 tablespoon herbs, sea salt, and 2 tablespoons oil until well blended. Mix in the flour, 1 cup at a time until a thick and somewhat sticky dough forms. Turn the dough out onto a lightly floured surface, and knead until smooth and elastic. Form into a ball, and place into an oiled bowl. Flip the dough to coat the surface. Cover the bowl with a clean dishtowel, and let it rise until doubled, about 1 hour. Punch dough down, and divide in half. Shape into an irregular ovals, about 1 1/2 inch thick. Sprinkle cornmeal over 2 baking sheets; transfer dough to pans. Brush each loaf with olive oil, and sprinkle the remaining herbs on top. Make several slashes in the bread, cutting through the dough with a knife. Cover the loaves with clean dishtowels. Let rise again until the dough begins to rise again, about 20 minutes. Place baking sheets into a preheated 450 degree F (220 degree C) oven. Quickly splash a small amount of water onto the floor of your oven to create steam, and close the oven door. Bake until golden, about 20 minutes. The only change I made to this was to double the herbs, and the bread turned out great--sort of chewy with a strong herb flavor. It's easy to make too.